I don't know what the weather is like where you are, but here in Denver it's bitterly cold. It's currently -8F/-22C. It's hard to believe that it felt like early summer only a few days ago. It's a good time to be recuperting and "stuck in doors" for a while. 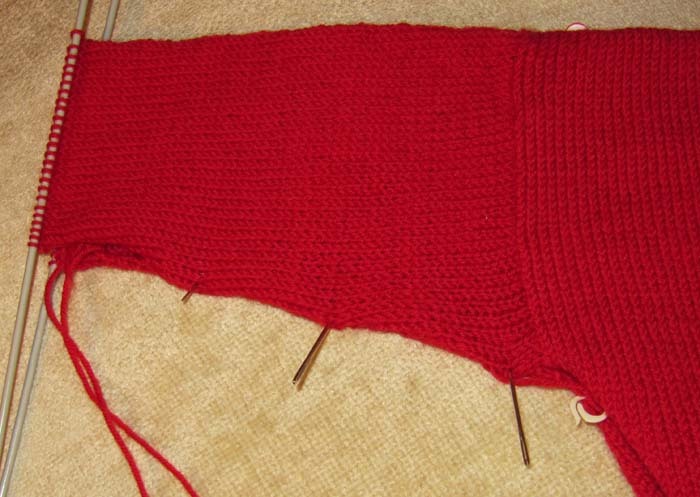 I've been working on Braydon's red sweater, using this pattern, which I won't use again. The shape, to my eye, is rather strange. All seemed fine (after I conquered the neckband fiasco) until I started knitting the sleeves, top down. While I believe that they are wide enough for Braydon's arms, no problem, they seem narrower than I've knitted baby's sleeves in the past. Also, the body seems long as so little of the sides were taken up with the sleeve opening. The proportions just seem wrong, but I'm hoping that they'll be okay when Braydon wears the sweater. The perfectionist in me tells me to start over, at least the sleeves, but at the rate this boy is growing, he'll only be able to wear the sweater for a short time anyway. As I said, I think it'll fit him alright. The shaping is just not what I'd call ideal. Hopefully it'll fit his teddy bear when he's finished with it. Otherwise, it's been a relaxing day: cold outside, a mug of hot tea nearby, knitting, fire in the wood-burning fireplace (love the smell), and a DVD - just finished playing. I'm not even allowing myself to get upset with the fact that I've run into 6, yes 6, knots in the yarn in just the sleeve. The other balls of yarn are fine, so, thankfully, just this one is defective. I am love-love-loving the DVD I've just finished watching. It's no secret how much I like music, and it doesn't matter where in the world it comes from: Europe, Africa, Canada, US....... One day, more than a dozen years ago, I was in Kingston, in the Indigo Book Store, late on a Sunday morning. Music was playing throughout the store and I was in awe of it. I had to move to one of the couches in the store and just listen. It was the Buena Vista Social Club CD and the music was from Cuba and it was different than anything I'd heard before. Of course I left with a copy of the CD and I've played it often over the years. 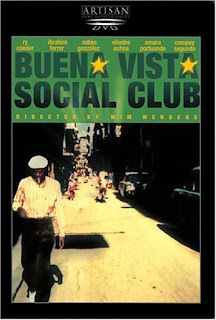 Today, while browsing Netflix, I found that there was a free showing of a documentary DVD about the making of this CD and included stories about the musicians: many who were big in Cuba decades ago but long forgotten. Ry Cooder brought them together again and the result was amazing. This is a very talented group. I know that I'll want to watch again, so I've ordered a copy of the DVD. Back to working on the sleeve, and relaxing. It's a good day here. I hope it is for you, too. It was 20F here in Boston this morning, and it felt "warm". I had to open my jacket, fleece, sweatshirt, button down sweater, flannel shirt to get some air! Of course, give it a few days and you're weather will be here. Good weather for being indoors! Several times I have found that the shape of kids sweaters seemed to be 'off', but in the end it doesn't look that way on the kid. Maybe kids are just shaped differently.